One of the down sides to getting married two days before the start of grad school is the fact that you really don’t get to go on a honeymoon right away. Irwin and I are still planning on hitting up France, but we’ll be going next summer instead. We still wanted to get away, with just the two of us, and the fact that Labor Day Weekend was a week after the wedding gave us the perfect opportunity to do that. The 3-day weekend was just enough time to get someplace that was a couple of hours away, so we decided to head down to Napa for the weekend. We didn’t have any big plans for the weekend – we mainly wanted to sit around and relax, with breaks to eat really good food and drink really good wine. I’m happy to say that we accomplished exactly that. The added bonus was that because it was so early in the semester, I was able to leave all of my books at home without feeling even a little bit guilty about it. I wasn’t going to fall that far behind and, if I did? I’d have plenty of time to catch up. That meant that any reading I did on the plane or while we were down there was fully and completely recreational. After a summer of having most of my brain space taken up by the wedding or by the medical terminology I was supposed to be learning, it was incredibly nice to just let it all go. We flew down to Oakland Saturday morning, and then made a quick pit stop in Berkeley for lunch on our way out to Napa. Irwin consulted Yelp for recommendations and we found ourself at The Cheeseboard Pizza Collective. What we didn’t realize until we got there is that their pizza of the day? Is the only pizza available. Your only decision is how much of it you want. The huge upside to this is that is moved the line along super-fast and there was zero wait for your food after you ordered. Sure, there’s some risk that you won’t like their pizza when you get there, but that wasn’t a problem that we had. Saturday’s selection? 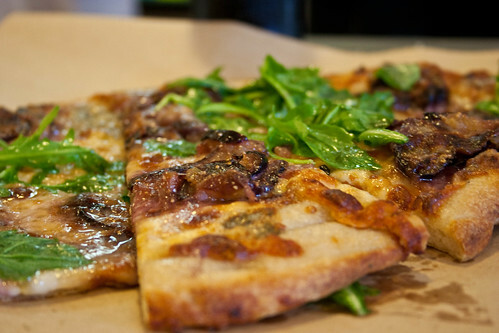 Fig, blue cheese, mozzarella and arugula tossed in lemon vinaigrette. Between the two of us we demolished half a pizza with some salad and zero complaints. There was enough blue cheese on it to lend a nice tang without being overpowering. From there, it was down the road to an ice cream place that was recommended by a friend of ours. They had a ton of really interesting flavors, all of which looked amazing. In the end, I went with the orange blossom honey and Irwin had the Earl Grey, both of which were incredible. With full bellies, we hopped in the rental and continued on to Napa. Our bed and breakfast was actually in Yountville, and we were right in the main downtown area which meant walking distance from some incredible restaurants. We made a beeline for Ad Hoc and, while they didn’t have any open tables, we lucked into two seats at the bar. Again, there was one option to choose from, but it was delicious. We enjoyed a dinner of a melon salad, rack of lamb with corn succotash, Landaff cheese and beignets with a variety of sauces. We’ve had the Ad Hoc cookbook sitting on our shelf for several months, and after eating there? I think we’re going to be making more of an effort to bust that book open. Everything was incredibly well-done and we had a perfectly leisurely meal. We arrived back at the hotel completely stuffed and almost unable to do anything besides relax. Sunday morning, I dragged myself out of bed for a 12-mile run because, hey! I’m still training for a marathon! I was thisclose to skipping it, but when it became clear I was just going to be lying in bed awake for those couple of hours, I decided I might as well get out the door. The weather was perfect (cloudy and cool) and when was I going to have another chance to run through vineyards? In the end, I am so glad I got myself out the door. The scenery was wonderful and the roads were quiet. It was a great way to kick off another day of relaxation and eating. The high points included brunch at Brix, wine tastings at Beringer, Whitehall and Paradigm, dinner at Bottega and dessert from Bouchon bakery. (Yountville is, seriously, Keller central. 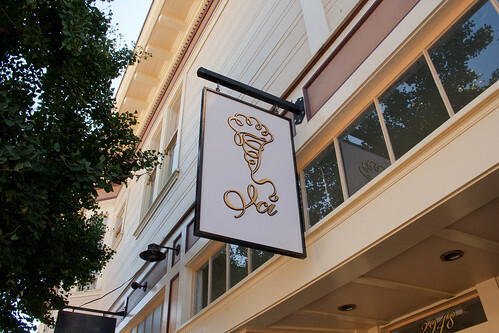 In the space of a mile, you have Ad Hoc, Bouchon and its bakery, and the French Laundry. Not to mention the gardens that provide produce for the restaurants.) While it was all fantastic, what stands out most in my mind a week later is the ricotta gnocchi from Bottega. It was served with a tomato sauce and basil oil, and the gnocchi itself was like little airy pillows of cheesy goodness. They were so light, so soft and so fluffy. I could have easily eaten several plates of them. I sort of want to try and make them at home, but not really, because I’m sure there’s no way that my version would really compare. They were just… heavenly. Sunday was our last day in town. We kicked it off by sleeping in and enjoying breakfast at our hotel. After that? We relaxed in the room until we had to leave to check out. 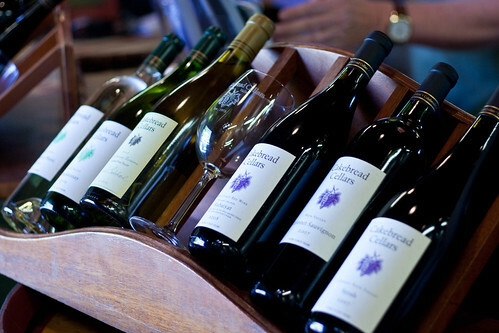 Our one stop of the day was a wine tasting at Cakebread. We elected to do their “new releases” tasting which let us try three whites and three reds. The only thing that stopped us from buying a couple of bottles was the fact that we didn’t feel like packing them in our luggage for the plane. Instead, we decided just to order them online once we got home. They have a reserve chardonnay which is meant to be aged for a few years and it was absolutely amazing. I very much want to get my hands on a bottle and then see what it’s like in another year or so. After that, we hit the road back to Oakland to catch our flight home. Our last meal in California? In-N-Out burger. Naturally.